As you may have noticed, I am on a personalization kick, and after seeing all the cool kids on instagram wearing Stella & Bow’s throwback bracelets, I wanted to make a couple of my own (and a few for my friends :). Spell out your name, your favorite saying, then exchange BFF arm swag or pair them with other friendship bracelets…pile them on! 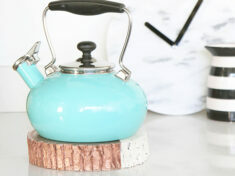 Details on how to make after the break! 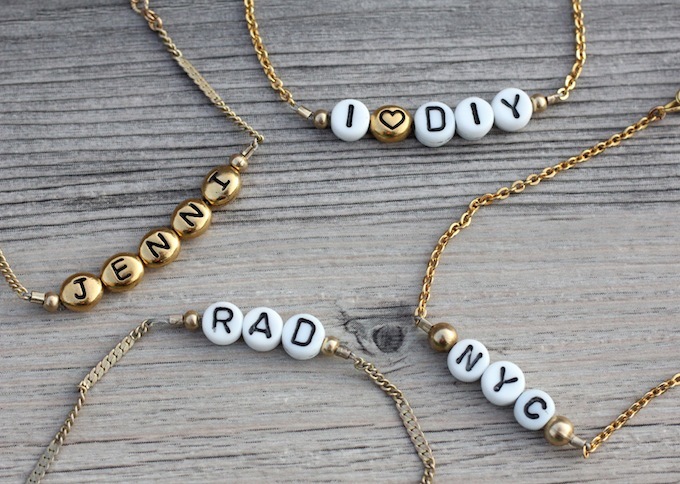 Next, string on your gold beads and letters onto the cable. Thread the cable through the other side of your chain, and add the crimp bead. Cut of the loose cable. Connect larger chain and clasp with jumprings. 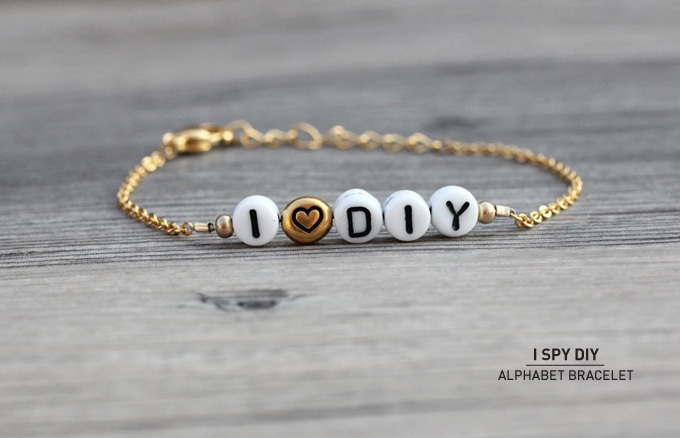 Hey, I also love DIY and your DIY bracelet is adorable. 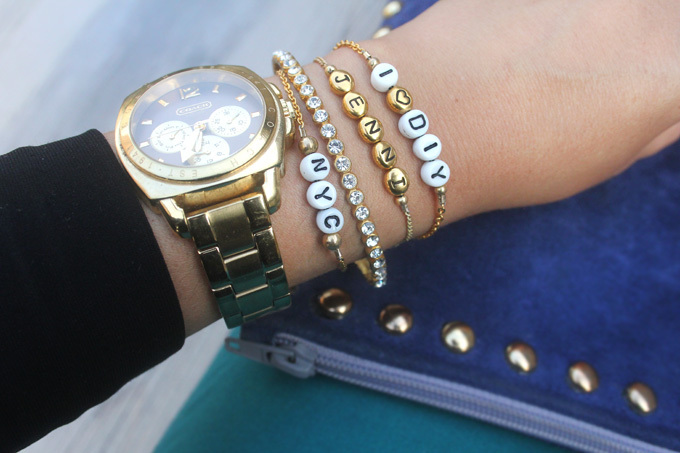 I love the idea of using alphabets in the bracelet, one can also gift this type of bracelets. Awww… so cute! I´ll try that out! Aah these are so cute! 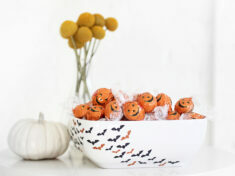 Want to make them..
Ah how lovely is this! When i was a little younger i also make some alphabet bracelets. 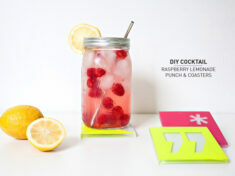 So gonna make them! We love this style of jewelery! You are an artist! Precious! I love how delicate these are. I really like these bracelets. They seem like a really great birth day gift or a gift for any occasion. I really like how the you can customize the message. Plus they look nicer than a regular stretchy bracelet. So cute! Would love to try and recreate this! The link for the DIY detailed crimp directions doesn’t work (for me at least)! 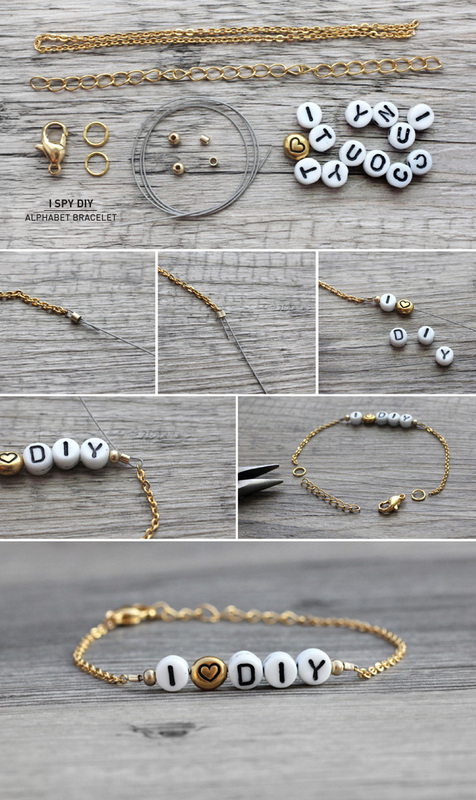 Think you could post a video of how you make these bracelets? That would be so awesome, and helpful! DIY PRODUCT LINE LAUNCH | SHOP #ISPYDIYSUPPLIES NOW!